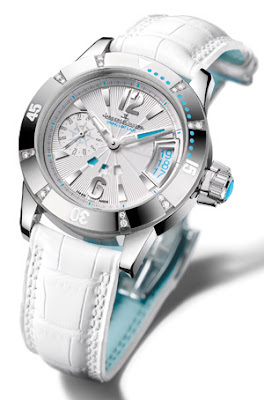 I wrote a post about the Jaeger LeCoultre diving watch for women and noticed many comments on the price of the watch. And yes, I do read all the comments and visit every site. So, I decide to find something that's comparable in style but at a savvier price. I found a good old American brand even if it is owned by the Swatch Group now, the Hamilton Below Zero Automatic, even though I like the blue accent on the JLC but for the amount of saving (you do the math), a gal can buy a couple turquoise color outfits and bags to go with the Hamilton watch. 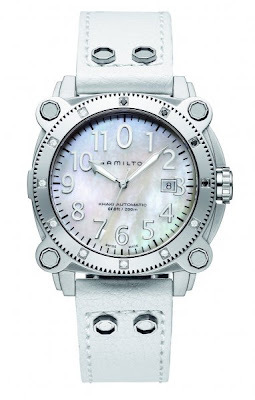 BTW, a gal can take this watch diving to about 200 meter. Can we survive at this depth? This particular model, the price ranges from about $950 to $1200 depending on the strap. Is it savvy or is the JLC more stylish? wow! those watches are fantastic! I love blue!!! i love a diving watch. These are pricey, but for a watch I believe in saving up for a good one if you can! i love your blog, can we exchange links? I prefer the diving watch on the right. There's something very sleek and less "pretty" about. Both really seem savvy to me though. I'd have the JLC watch purely because I'm not a fan of mother of pearl watch dials. The dial on the left also has that little clock inside and I just love those! Wow! Those are fantastic! I need one! the JLC is a chronograph watch so has a timer, or the little clock looking thing.